Select a startup location of FocusOn Image Viewer. Set most recently used location as a startup location. 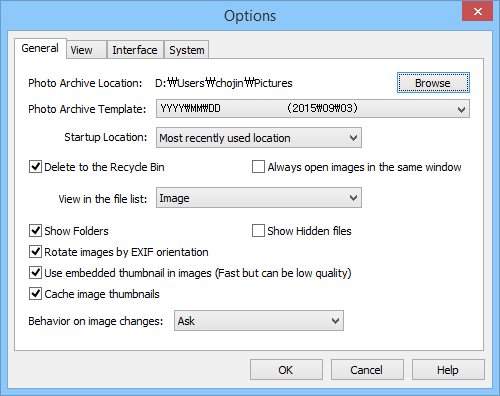 Set the photo archive location as a startup location. Set last directly changed location as a startup location. This exclude a location changed by Windows file explorer. Move a file to the Recycle Bin when deleting. 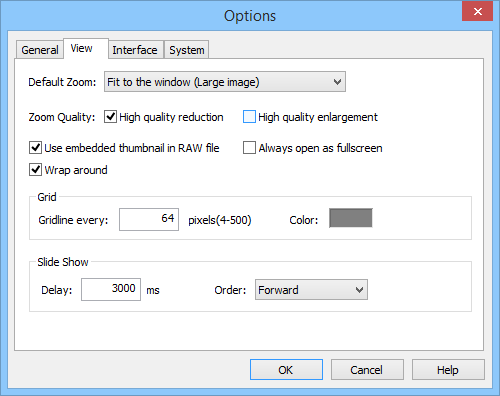 Run only one instance of FocusOn Image Viewer and view images in the same window. Select item types to show in the file list. Show image files and document files in the list. Show folders in the file list. Show hidden files in the file list. Rotate images by EXIF orientation. Show images rotated by EXIF orientation. Use an embedded thumbnail in images when generating thumbnails. Save the generated thumbnails in the cache to use it again. If an image is changed, you will be asked. If an image is changed, the changes will be saved to preserve. Zoom the image to 50%. Show the image in its original size. Zoom the image to 200%. Use high quality zoom when shrinking the image. Use high quality zoom when enlarging the image. Show RAW file using the embedded thumnail in RAW file. Fast. Always open as fullscreen when changing to the Image View mode. Go to the last or first image when going over the first or last image continuously. Specify the interval to show the grid. Specify the color of the grid. Enter the time to show the images in the slide show. Go to the random image. If scrolling is possible, scroll the image. Otherwisze select an area of the image. Select an area of the image always. Go to the previous image when clicking the left area of the image and go to the next image when clicking the right area of the image. Go to the previous or next image on click in the fullscreen. Go to the previous image when clicking the left area and go to the next image when clicking the right area on the fullscreen. hange to the List View mode when double clicking the image. Go to the previous or next image when scrolling the mouse wheel. Zoom the image when scrolling the mouse wheel. Go to the previous or next image when pressing the arrow keys. Scroll the image when pressing the arrow keys. 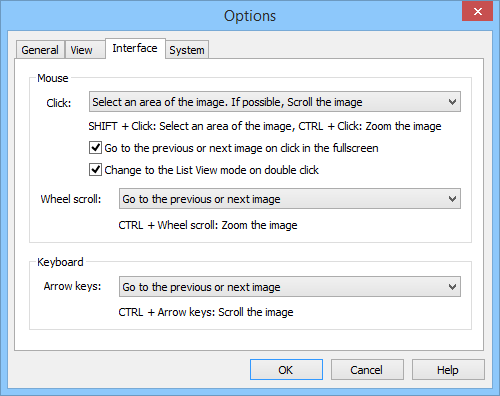 Add 'Browse with FocusOn Image Viewer' menu to the Windows File Explorer's context menu of the folder. 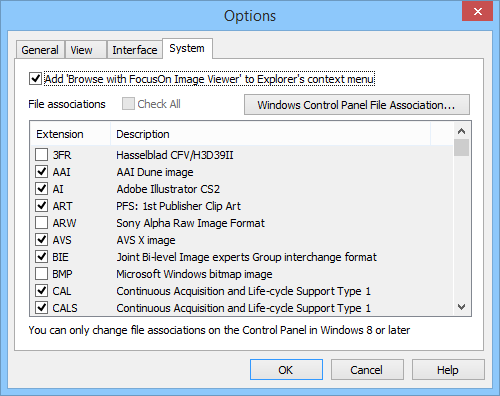 Associate the selected file extension to open in FocusOn Image Viewer. Open Windows Control Panel File Association. You can only change file associations on the Control Panel in Windows 8 or later.